Olivia Colman | Cinema, etc. Sometimes you watch a show on TV with no prior knowledge of the content, with no preconception of what is coming. Usually when you do this, you’re left disappointed and quickly switch over or find yourself checking your phone at decreasing intervals. Sometimes, if you’re lucky, you’ll find a gem, a diamond in the rough. So it was with the gripping BBC two-part romantic drama The 7:39. Starring David Morrissey (The Walking Dead) and Sheradin Smith (Legally Blonde), with supporting roles from Sean Maguire (Eastenders) and Olivia Colman (Tyrannosaur), the story tells the chance development of an affair between Carl (Morrissey) and Sally (Smith), who catch the same eponymous commuter train. Both unknowingly in a rut in their life at home and at work, they quickly find an unlikely spark between each other and grow closer through the increasingly precious time they spend together en route to work. Carl has a lot more to lose. He is married with two teenage children and has an exceptionally supportive wife (Colman), but yet he is the driving course behind the forbidden relationship. Sally is engaged to her overprotective fiancé Ryan – brilliantly portrayed by Maguire – who is hellbent on arranging the perfect wedding and seemingly attempting to smother every aspect of Sally’s life, though only out of love and devotion. It is a sign of excellent writing by David Nicholls (One Day, Starter For 10), matched by perfect performances by the highly talented cast, that we quickly find ourselves rooting for Carl and Sally. Seeing them play out this despicable action, knowing they’re on a collision course to devastate everything they know and love, I was surprised that when the chance arose I was on the edge of my seat willing them on to go for it. It is a deed we hope we would never be subjected to by a loved on – or even worse commit ourselves – yet the reasoning is portrayed fully without ever needing to be spelled out. Of course, the subject matter has divided audiences, but that is the sign of a powerful work of art. It is wonderful that there is such high quality drama being produced in the UK and that there is an outlet for the all-British cast to excel on prime-time television. It could easily have had a successful cinematic release and wouldn’t have looked out of place on the big screen. Hopefully it is the first of many more of its ilk. 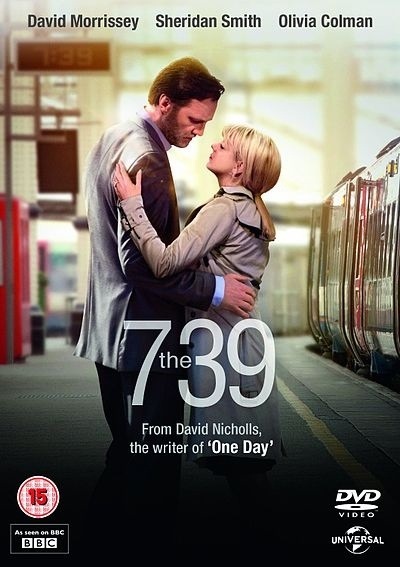 The 7:39 is available to watch for free on iPlayer and Sky On Demand until 14th January 2014 and is released on DVD on 10th February 2014.